Synopsis: If you were told to spend 1 billion yuan in a month as a condition of inheriting another 30 billion yuan, how would you spend it? 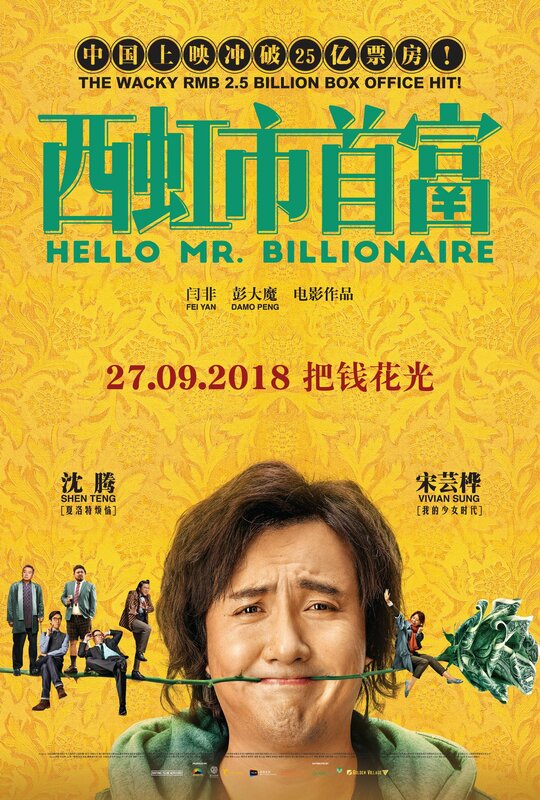 ‘Hello Mr Billionaire’ marks the third box-office hit in a row for Beijing-based theatre company Mahua FunAge, and it is not difficult to see why. Like their 2015 time-travel lark ‘Goodbye Mr Loser’ and last year’s body-swap comedy ‘Never Say Die’, this movie uses a magical-realist premise of a middle-aged loser given a second shot at success in life to critique the state of modern-day Chinese society – more specifically, writer-directors Yan Fei and Peng Damo take aim here at the notions of wealth and privilege, which have been the source of much resentment and consternation among both the well-to-do and the less well-to-do, albeit for different reasons. 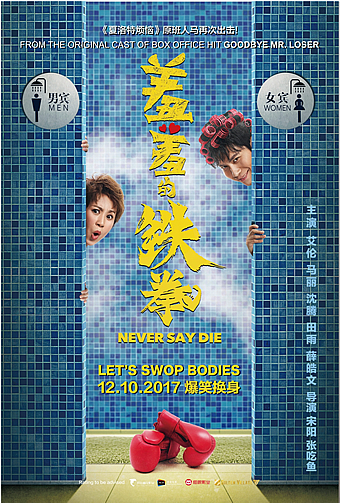 But you don’t need to be one of its one billion people to enjoy this social satire, for thanks to character comedian Shen Teng as the titular rich man, this is equally entertaining and just as hilarious as broad comedic farce. So ‘Billionaire’ begins with Teng as the lousy goalkeeper Wang Duoyu for Class C football team Daxiang, who is offered a RMB200,000 bribe to let in three goals from the opposing side. What does he have to lose, says the gangster-like figure (Zhang Jingguang) at the other end of the table; after all, it’s not like it would have made a difference to the eventual outcome of the match. Tuns out that the person offering the bribe is really the custodian of the enormous wealth of RMB30 billion left behind by a filthy rich Taiwanese tycoon, who happens to be Duoyu’s long-lost second grandfather (Lin Liqun), and the earlier bribe was just the first of a number of tests that Duoyu would need to pass in order to inherit the money. His next challenge is this: to prove he is worthy of being a billionaire, he would have to demonstrate that he is able to spend RMB$1 billion within a month legally and without donating to any charity. Such is the stuff of dreams for many younger (hypocritical) Chinese, who long to be counted amongst one of the children of the nouveau riche (or 富二代as they are commonly known), and who also therefore express bitterness towards the extravagant habits of these privileged few. How does Duoyu behave? He rents the most expensive hotel in town and makes it his home; he gives each one of the staff at the hotel start-up capital to realise their wildest dreams, while investing in outrageous inventions such as a ‘land swimming’ device; he opens a new investment company and makes his ne’er-do-good buddy Zhuang Qing (Zhang Yiming) its CEO; he spends millions to fly the world’s top investment banker into town to have lunch with him; and last but not least, he organises an elaborate fireworks show for the whole town to see. It’s downright over-the-top all right, and absurd really, but the exaggeration is certainly meant to emphasise the sheer profligacy of these second-generation wealthy types. At least for the first hour, Duoyu is indeed too easy to hate, especially as he also uses his wealth to impress his newfound love interest Xia Zhu (Vivian Sung), including buying up advertisements in every corner of the city and organising a private Wang Lee Hom concert. But you wouldn’t have much of a movie if Duoyu were just selfish and unlikeable, so the second half forces Duoyu to confront not just the folly of his ways but also the extent to which he is willing to let his wealth define what sort of person he is. An overlong football match he pays to organise between Daxiang and the national championship team Hengtai becomes a show of endurance and perseverance by the underdogs, while an unexpected kidnapping forces him to decide whether he is willing to lose his claim on the inheritance just so he can pay the ransom to save someone he cares for. Hint: this is a movie that needed to demonstrate the right morals in order to pass the Chinese censors in the first place. Not surprisingly therefore, before the credits roll, there is a didactic message about how safeguarding one’s humanity is more important than preserving one’s wealth. Thanks to Teng, who is capably convincing as someone who loses his way because of money and then eventually rediscovers his conscience, the moral education lesson doesn’t ring false. Oh yes, Teng is the movie’s very tour-de-force, navigating the earlier slapstick gags with aplomb and injecting real gravitas when the time comes for his character to make the choice of doing right. 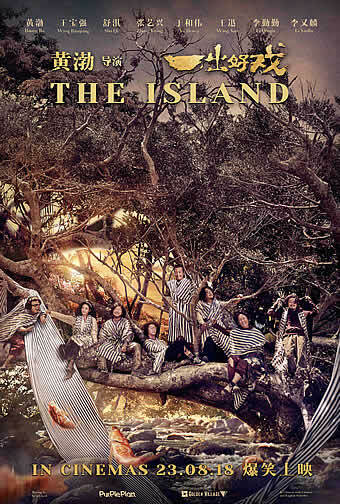 Teng’s charisma also carries the film through its more uneven portions, especially in the second half where the narrative gets carried away with multiple players hatching multiple schemes intended to sabotage Duoyu. 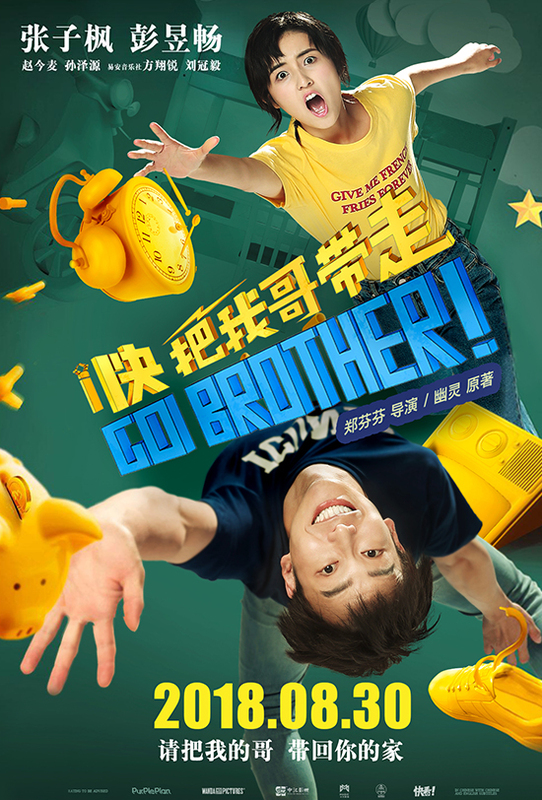 Notwithstanding, both Fei and Damo deserve credit for staging a couple of truly rib-tickling set-pieces: among the standouts are one where a traffic racketeer attempts to blackmail Duoyu and Zhuang Qing by pretending to be knocked down by their vehicle; another where Duoyu offers Xia Zhu’s self-righteous educationist boyfriend a job as a gardener at the hotel he had booked with a handsome salary and inadvertently exposes him for the hypocrite he is; and last but not least a hilarious musical sequence set to the chorus of ‘calorie, calorie, calorie’ as the Xihong city becomes seized by a healthy-living craze in response to Duoyu’s insurance business that gives his customers RMB1000 for losing 1 kg of fat. Thanks to these and many other amusing gags, their movie’s comic appeal isn’t just confined to culturally specific satire. Like we said at the start, it’s not hard to see why this film has struck a chord with Chinese audiences, and we’re not surprised that you’ll enjoy it just as much too. After all, the very premise of suddenly striking it rich should certainly resonate with anyone who’s ever hoped of winning that million-dollar lottery prize, and the issues of societal wealth and privilege portrayed here are also manifested within our own society. The movie also confirms Shen Teng as one of the foremost comedians of this generation, so much so that we dare say we won’t be surprised if we is mentioned along the likes of Stephen Chow, Huang Bo and Wang Baoqiang. It may sound like a cliché, but we’re not afraid to say that ‘Hello Mr Billionaire’ had us at hello.